The Northern Mindanao RSDP 2018-2023, the region’s first edition of the RSDP, is a compilation of statistical activities and their corresponding budgetary estimates to be undertaken by the RSS in response to the requirements of development planning and policy formulation in the region. It is the region’s equivalent of the Philippine Statistical Development Program (PSDP) 2018-2022, which aims to address the data requirements of the RDP 2017-2022 and Sustainable Development Goals. This RSDP serves as an input to the Local Statistics Development chapter of the PSDP. Broadly, the RSDP envisions a responsive, effective and efficient Northern Mindanao regional statistical system that delivers quality statistics, products and services for evidence-based decision- and policy-making towards the attainment of the region’s development goals. With political support and adequate resources, the RSDP shall facilitate and ensure the production of statistics in aid of good governance towards laying down the foundation for inclusive growth, a high-trust society and resilient society, and a globally-competitive knowledge economy. The vision can be achieved by carrying out the RSS’ mission to provide quality statistics, products and services to the public; strengthen statistical planning, coordination, and capacities; and improve data generation and storage, access and dissemination. The RSDP will focus on five strategic priorities: 1) data collection and production, 2) coordination of the regional/local statistical system (R/LSS), 3) data dissemination and use, 4) research and capacity-building, and 5) resources in the RSS. The RSDP has seven chapters, with the first six chapters featuring key milestones of the RSS for the period 2016-2017, and issues and challenges faced by the sector. The last chapter identifies priority statistical programs for 2018-2023. In general, the RSDP acknowledges the need for improved standards and methodologies in data generation, local level or disaggregated statistics, timely release and easy access of statistics, establishment or improvement of database and information management systems, enhanced and strategic statistical financing, use of technology in the collection and processing of data, and effective communication and stakeholder engagement, among others. It also takes into account recent developments and emerging issues such as the country’s long-term vision or AmBisyon Natin 2040, the country and region’s medium-term development plans, reorganization of the PSS and establishment of the PSA, climate change/disaster risk reduction and management, and international commitments such as the Sustainable Development Goals (SDGs). The RSDP is a rolling document, and shall be reviewed annually in RSC meetings and other venues of exchange and sharing of knowledge among critical partners. It is hoped that the statistical programs and priorities indicated here will be considered and implemented by the concerned stakeholders. Through this document, statistical development is expected to be harnessed with the development vision of Northern Mindanao as one of their primary inspirations. Republic Act No. 10625 ‘An Act Reorganizing the Philippine Statistical System (PSS) and Creating the Philippine Statistics Authority (PSA)’ provides for the preparation of the Philippine Statistical Development Program (PSDP). 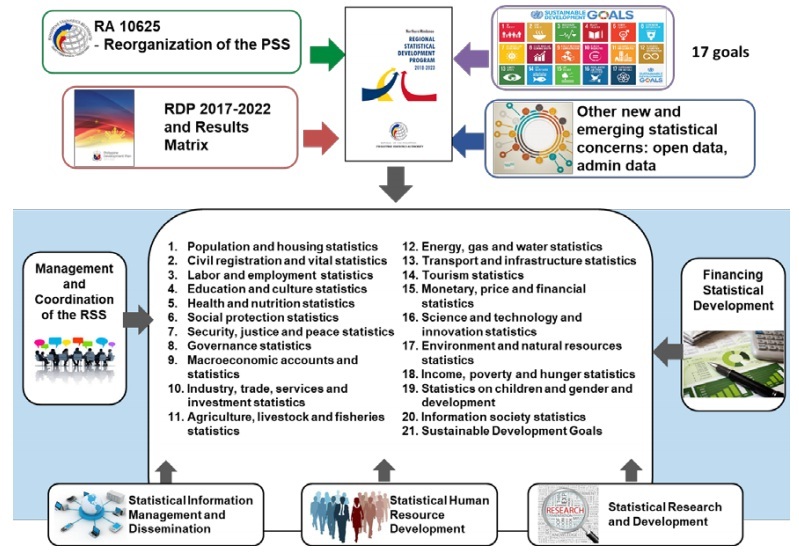 The PSDP is a mechanism for setting directions, thrusts, and strategies in the PSS and for defining the priority statistical development programs and activities undertaken in the medium-term. The PSDP 2018-2023 guides the statistical development of the PSS and furnishes the Philippine Development Plan (PDP) 2017-2022 with vital statistical information necessary in measuring the country’s progress and formulating policies, taking into account the priority strategies, targets, and activities in the medium-term. At the regional level, the Regional Statistics Committees (RSCs) shall provide guidance and directions in the formulation of the Regional Statistical Development Program (RSDP) covering the period 2018-2023. Similar to its national counterpart, the RSDP shall lay the necessary framework for generating and disseminating statistics and indicators needed in policy formulation, development planning, and decision making by various stakeholders and data users in the region. The involvement of various stakeholders such as the statistical agencies and national government agencies in the region, local government units (LGUs), private sector, and other data producers and users is fundamental in the formulation of solid, comprehensive, responsive, and attainable statistical programs for the medium-term. The main considerations in the formulation of the RSDP are the data requirements of the Northern Mindanao Regional Development Plan (RDP) 2017-2022, including its Results Matrices, various sectoral plans, and emerging data needs such as the Sustainable Development Goals (SDGs). The RDSPs form part of the Local Statistics Development Chapter of the PSDP 2018-2023. The RSS is the network of government agencies in the region providing statistical information and services to the public. It consists of statistical organizations at all administrative levels in the region, the personnel therein, and the statistical development programs. It also includes a policy-making and coordinating body (RSC), a single general-purpose statistical agency (PSA), and all the bureaus, offices, agencies and instrumentalities of the regional and local governments and all government-owned or controlled corporations and their subsidiaries, which are engaged in statistical activities either as their primary functions or as part of their administrative or regulatory functions. It shows therefore that data-gathering production activities in the government are undertaken by different agencies. In order to harmonize and integrate the statistical data produced by these agencies, as well as to enhance the efficiency of the overall RSS, planning, coordination and policy formulation are needed. These functions are important in priority setting such that the limited government resources are allotted to the more important activities relative to the demands of data users. The RSS is an important part of the national statistical system. Its development is crucial to the overall development of the Philippine Statistical System (PSS) which needs to be more responsive to government and to the general statistical needs of the country. Following the structure of the PSS, the RSS has likewise been decentralized, with statistical operations and activities undertaken by all government offices/unit at that level. A responsive, effective and efficient Northern Mindanao regional statistical system that delivers quality statistics, products and services for evidence-based decision- and policy-making towards the attainment of the region’s development goals. To provide quality statistics, products and services to the public; strengthen statistical planning, coordination, and capacities; and improve data generation, access and dissemination.